You gave it a 6.5? Why such a low score? Shouldn't it be more like an 8? On the IMDb it has a 7.5 rating. I've been on a movie marathon for about two weeks now. A lot of duds lately may have jaded my views. I really can't pinpoint WHY I gave it such a low score. On hindsight I can see this film being a 7.5 and maybe a little higher. I have had this on my wish list to purchase for over a year now and see no reason not to go ahead and get a DVD copy. What did you like about the film? Some of what you mentioned-- the story, the performances, the excellent MGM production values and of course Tourneur's fantastic direction. Other westerns to recommend by Jacques Tourneur include CANYON PASSAGE and GREAT DAY IN THE MORNING. Canyon Passage is highly regarded by a few members over at Sergio Leone Board. I might give it a look. One of their former members is a big reviewer over at IMDb and says its highly underrated and that it looks like something John Ford would have done. I finally figured out what made me give the lower rating that the film didn't deserve. Added to the fact that I've been on a movie marathon is the fact that I saw MOST of the movie the first time around on TCM and wasn't aware of that fact. So, when I watched it again i was expecting a lot more from the film. The part that I did see originally easily gets a 8 out of 10. The part I didn't see was the initial arrival of Gray and his initial confrontations with the locals. I loved the bar scene when he first met some of the locals and I loved how he took care of that whipping scene where the guy was bullying that other guy. The parts I didnt like were MOST of the scenes with the young doctor. I felt it bogged the film down a little bit and took from what I felt were the more compelling themes of Gray running around Clint Eastwood style and handling business and the other theme of Uncle Famous Prill defending his land. I'm gonna tweak my rating to a 7.5 rating. I believe IMDb has it right. Yeah, you have to examine a film on its own merits. This is why B movies tend to have lower scores, because reviewers are expecting them to be big budgeted A films. Instead of looking at them on their own terms, and seeing what they accomplish given budget and available casting. Also in your previous post you said someone said CANYON PASSAGE seemed like something John Ford would have directed. No, it seems like something Jacques Tourneur would have directed! I don't get why people need to compare directors, automatically suggesting one is better than the other. CANYON PASSAGE can currently be streamed on Starz. Plus it has been issued on some economic DVD sets with other westerns by Universal. You can find it for sale on Amazon. I agree that one has to examine a film on its own merits, but when rating films doesn't one have to compare their ratings between films? ; I.e. one is giving a rating NOT only on an individual film, but also as that film 'sits' in the universe of films. E.g. a 8 rating on 20 different films says that these films are comparable in terms of quality (or enjoyment, or whatever the criteria one uses for a rating). But hey, ratings are way overrated (say compared to actual statements about the merits of a film like what you provide). I agree with your comment about B films. For example, Humphrey Bogart is my favorite actor but I love to dismiss both The Maltese Falcon and The Big Sleep as overrated hyped big budget films that are nowhere near as good as dozens of B film noirs I have seen. Heck, there are lots of B films that I have seen that I didn't know were B films into you or someone else pointed it out either here or over at Sergio Leone Board. Thats a advantage that I have right now that I love. Not knowing who most of these actors, directors ( thats fastly becoming untrue), and production companies, etc. are. When I screen a film I'm not coming in with preconceived notions of how the film should be. I just rate them. I love to pick on Orson Welles and Carol Reed for this very reason, lol. Great LOOKING films that students of film can dissect and love but boring films for movie goers. As far as Jacques Tourneur and John Ford go, the comment I was referring to was actually giving Tourneur a compliment. He was saying that IF John Ford had directed Canyon Passage, then John Ford fans would've given it the credit it deserved. I agree with your comment about B films. For example, Humphrey Bogart is my favorite actor but I love to dismiss both The Maltese Falcon and The Big Sleep as overrated hyped big budget films that are nowhere near as good as dozens of B film noirs I have seen. Note that The Maltese Falcon wasn't a big budget 'A' production. This was John Huston's first time at directing (he was an under contract screenwriter for Warner Bros), and that is why George Raft turned down the role of Spade and it was given to mostly supporting actor Bogart (after his solid performance as a lead in High Sierra). This is also why Mary Astor was cast instead of a much bigger WB under contract actress like Ann Sheridan or even Priscilla Lane. Also, Greenstreet's first film. Huston was given a limited budget and shooting time (but since he was directing from his own screenplay, he made it work). NOW, I really love The Maltese Falcon because of how it flows from scene and it very 'tight' IMO. It really set the tone for future 40s detective movies. As for The Big Sleep; Yes, big budget film and due to the popularity of all thing Bogie\Bacall is somewhat marred, especially when viewed as a noir film. E.g. too much romance, and too much Bogie as a ladies man, that takes off the hard noir edge. BUT I love the film because I'm a sucker for romance. So while I agree that The Big Sleep isn't as good as a NOIR film as dozens of B film noirs, as an other all film, I feel it stands above. Of well to each his own. PS: Sorry for posting this in the "western' thread. I should have made this reply in the Noir thread when you first made those comments. But would we give John Ford a compliment by saying something he directed was like Tourneur's work? No. So these comments are someone on the IMDb suggesting Ford is better, Ford is higher on the list of all-time directors, which seems really out of place when discussing a film like CANYON PASSAGE that had absolutely nothing to do with him. It's almost like saying Stephen Sondheim is good but comparing him to Mozart. Why? What's the point? Evaluate him on his own terms, based on what he did, not what someone else did. Who says film ratings are determining where a film sits in the universe of films? Interesting idea but totally implausible in my viewpoint. You would have to keep re-rating it because the universe of films is expanding. So where it sits now would not be where it sits in five years when a thousand more films have been released. You would have to re-rate it against newer cinema. That would be unending (as long as movies are being made). So I think you have to rate it against its own time and its own resources (talent and budget). And part of this also has to take into account its attempts to be a product of a certain fad of acting, historical cinematic trend and/or relative value to its self-ascribed genre. I agree with you and I believe the poster that made the comment agrees with you. Again, it shows that I don't know anything about most of these films as far as the context in which they were made. I think it gives me a neutral advantage as far as my ratings. I only learn of their production after the fact if I decide to review them or if someone tells me about the production. Yes, sometimes you have to set their so-called "pedigree" aside and just let them work their magic on you (or not). Occasionally I force myself to watch a cheap poverty row film in the public domain on YouTube, just so it reminds me to look at film for film sake, not for household name or box office or these other artificial labels that get put on so-called "classic" film. There is always some value to be found in a film. Canyon Passage is directed by Jacques Tourneur and is adapted by Ernest Pascal from the novel written by Ernest Haycox. 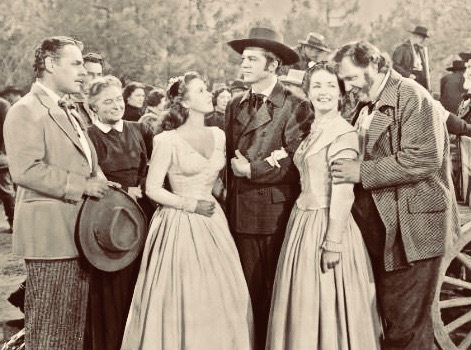 It stars Dana Andrews, Brian Donlevy, Ward Bond, Susan Hayward, Lloyd Bridges & Patricia Roc, with Hoagy Carmichael also supporting and offering up ditties such as the Oscar Nominated "Ole Buttermilk Sky". Music is by Frank Skinner and cinematography by Edward Cronjager. More famed for his moody black & white pieces, Canyon Passage finds Tourneur operating in glorious Technicolor on Western landscapes. The result of which is as gorgeous as it is thematically sizzling. The story follows Andrews' Logan Stuart, a former scout turned store & freight owner who has landed in Jacksonsville, Oregon. Also residing here is the girl he is courting, Caroline Marsh (Roc) and his friend George Camrose (Donlevy) who plans to marry Lucy Overmire (Hayward). However, there are problems afoot as George has a serious gambling problem, one that will send this tiny town into turmoil. Affairs of the heart also come under pressure, and to cap it all off, the Indians are on the warpath after the brutish Honey Bragg (Bond) kills an innocent Indian girl. The first thing that is so striking about Canyon Passage is the town of Jacksonville itself, this is a vastly different Western town to the ones we are used to seeing. Built in a sloping canyon that helps to pump up the off kilter feeling that breathes within the picture, it's also green, very green, but in a most visually refreshing way. The greenery and red flowers give a sense of harmony, a sneaky way of diverting the viewer from the smouldering narrative, for Tourneur is delighting in not only painting a pretty picture that belies the trouble bubbling under the surface of this apparent place of prosperity, he's also revelling in using various camera shots to embody the unfolding story and the characterisations of the principals. This really is a film that begs to be revisited a number of times, because with each viewing comes something new to appraise, to pore over to see just why Tourneur did something particular. The host of characters are varied and have meaning, each given impetus by the uniformly strong cast, the latter of which is also a testament to the supreme direction from the Parisian maestro. Thanks Moorman for sharing the review of CANYON PASSAGE. (I know you originally meant to discuss STARS IN MY CROWN.) The reviewer does a good job stating how Tourneur uses Technicolor in an almost subversive way. And yes, if it was a John Ford film it would probably be better known, but it doesn't have to be a Ford film. In fact I don't really see how Ford (or anyone else) could have improved this picture since it's masterfully made. What helps distinguish this one from Tourneur's other westerns is the lavish budget that Universal and producer Walter Wanger allocated for it. Plus the entire cast is just perfect. I especially loved Andy Devine's comic relief (plus his real-life kids play his kids in the movie), Ward Bond's skill at conveying the callousness and brutality of a white man who sexually assaults a native woman, and of course Brian Donlevy as a more "respectable" villain who swindles local men. Then there's the triangle between Dana Andrews, Patricia Roc and Susan Hayward. A lot happens in CANYON PASSAGE.